Major release 5.0 (April, 2019). This video shows in more detail how xsd2code ++ handle JSON schemas. Full implementation of ShouldSerialize[PropertyName] method for all king of type (Nullable, Complex type, Simple type, string). The setting “Custom Usings” are not updated into the file. Add restriction support ([StringLengthAttribute=true/false], [RegularExpressionAttribute=true/false], [RangeAttribute=true/false]). Allows to force DataMember attribute when XmlIgnore attribute exists. Prefix private fields with a custom value is now possible (PrivateFieldName=StartWithCustomPrefix + PrivateFieldCustomPrefix). Use XmlSerializerFactory().CreateSerializer(T) instead new XmlSerializer(). Creates typed versions of the XmlSerializer for more efficient serialization. Bypass change notification in property setter for complex types or collections when the current and new value are null. Fixed, The documenation (xml annotation) is not generated in case of enumerations if name contains spaces. Fixed. Remove XmlElementAttribute if already have an XmlArrayItemAttribute on collection property. Major : The ExludeImportSchemas option causes in some cases duplicate propertiesclasses or enums. Major : Compilation error if xsd contains reserved csharp keywords and if AutomaticProperties is true. Major : Serialization exception because of unnecessary XmlTextAttribute. Minor : XmlIndent option do not update code when the value change. C# reserved keywords are not managed if AutomaticProperty is enable. Remove unsued field in case of AutomaticProperty = true and if private field type is Object. Add explicit message in case of cicircular group reference (not suppoted by xsd2code). 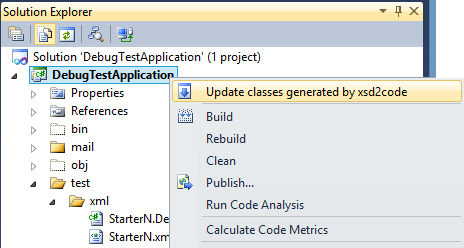 Better performace for the return to Visual Studio. Fix error : For security reasons DTD is prohibited in this XML document. Fix compilation error if ShouldSerializeProperty = true and collectioType is Array. In solution explorer it is now possible to generate code from xml file.